Pedisystems Entrance Matting for Moderate to Heavy Foot Traffic. CS. Pedisystems Entrance Matting is a versatile solution for a range of moderate to heavy use applications. The Pedisystem Entrance Mats are available in the Pedimat, Pediluxe and Pedigrid ranges, each with their own characteristics and advantages. Pedimat is ideal for moderate use applications such as hotels and banks; while Pediluxe and Pedigrid are better suited to very high traffic environments such as hospitals and transport termini. Pedimat and Pediluxe can be recess or surface mounted, while Pedigrid is designed exclusively for recessed applications, but benefits from an extra deep matwell. Read about the three systems to discover the best solution for your application, or contact ABS West to discuss the options available for your project. A WIDE RANGE OF TREAD INSERTS TO CHOOSE FROM. RECESS OR SURFACE MOUNTED INSTALLATION OPTIONS AVAILABLE. Recommended for buildings in moderate use e.g., offices, shops, hotels, banks. Suitable for high volume areas such as shopping centres, hospitals, entertainment venues & passenger termini. Exclusively for recessed installations, particularly new construction projects where high traffic levels are predicted. Entrance flooring products you can trust! It's for good reason that CS entrance matting surfaces have been used worldwide for decades! Where beauty meets function! 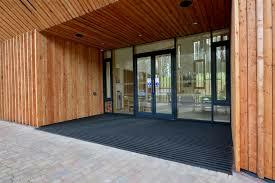 CS entrance matting looks stunning; is extremely hard wearing & offers a long service life. Achieving the desired look at an entrance is easy with such versatile products that are customisable in terms of shape and insert options. The range is versatile enough to offer solutions according to budget & project, from moderate use through to heavy use. CS matting systems help to maintain safety at a building's entrance due to superior dirt & moisture removing capabilities. Suitable for use on both sides of a building's entrance, and within revolving door systems. Installation is quick & simple. Easy maintenance allows mats to be kept clean & in optimum condition. CS mats help to prevent migration of dirt & moisture to adjacent areas, which minimises internal cleaning costs & extends the life of interior floor finishes. Pedimat is an 11mm deep aluminium profile entrance matting system recommended for buildings in moderate use such as offices, shops, hotels and banks. Pediluxe is the most versatile of all the aluminium profile entrance matting systems. It combines rugged construction with luxury feel underfoot. Its exceptional load bearing capability makes it especially suitable for high volume areas such as shopping centres, hospitals and passenger termini. Pediluxe is available in enough tread and colour options to satisfy the most demanding project requirements. At 17mm deep, it fits directly into most existing matwells, facilitating quick and easy installation. C/S Pediluxe Gold, the brass rail version, offers a simply stunning quality and appearance. Field changeable inserts without the use of specialist tools for low lifecycle costs. Pedigrid is an entrance matting system with a removable grille section that allows water and dirt to fall between treads into a drainable well below. Pedigrid entrance mats are designed exclusively for recessed installations. The advantage of a deep matwell (44mm depth) is reduced cleaning and maintenance. Pedigrid entry mats are purpose built according to specific modular dimensions and shapes for your project. The system is especially suitable for new construction, where there will be high foot traffic such as hospitals, shopping centres and transport hubs including airports and train stations. Take a look at the stages involved in replacing an old entry mat at the University of Western Australia, with a new custom made CS Pediluxe entrance mat. Help to reduce slip & trip incidents by installing reliable, long-lasting entrance matting systems.